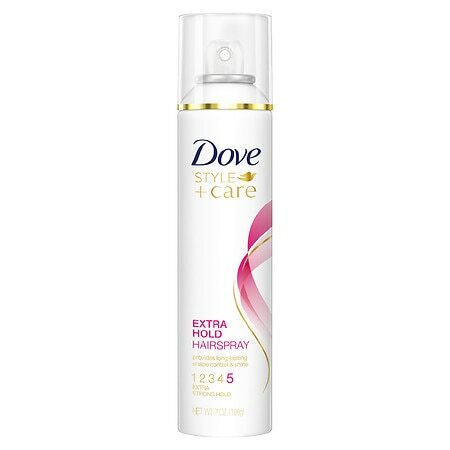 – Dove STYLE+care Hairspray, Strength & Shine, Extra Hold, 7 oz Love Your Hair 1 1 With Nutri-Style Complex 2 All day hold and enhanced luminosity At Dove we know better style comes through better care. – Strengthens your hair style by providing strong hold while enhancing your hair s natural luminosity. – Dove Style+Care trade; with Nutri-Style Complex provides long lasting style by nourishing and protecting hair to prevent hair issues such as frizz, fly-aways and dry/split ends that get in the way of a great style. – Its fast drying formula fights frizz and fly-aways while adding body and volume. – Made in USAEnjoy extra hold without all the stiffness, for shiny hair with natural movement all day long. Beauty: Matte + Poreless Powder by Maybelline Fit Me!